The trend towards downloadable titles have yielded quite in the influx of quality games from small studio and indie developers. Thanks to the likes of Steam, Impulse and numerous other digital distribution platforms, these studios are now capable of getting their product in front of millions of customers without incurring the cost of physical distribution and advertising. Tragnarion Studios is one such developer, hailing from Spain, they hope to get their foot in the door in the competitive games industry with their second title, The Scourge Project, the first being a Nintendo DS game called Doodle Hex. Built on the Unreal Engine 3, The Scourge Project puts you and up to three friends together in control of Echo Squad. Your goal is to deal a blow to the Nagari Corporation, who have developed and profited from a unique element called Ambrosia. The Scourge Project shares a lot of similarities with other Unreal Engine 3 powered titles, namely Unreal 3 and Gears of War. The latter you'll notice the style of the characters are similar, but also the way the game plays. Considering Gears has you in control of Delta Squad and The Scourge Project has you controlling Echo, you almost immediately make the connection. 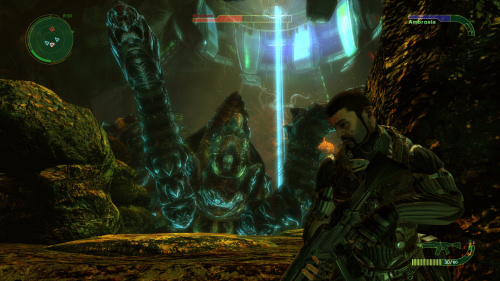 Like Gears you'll find yourself locking into cover as well as blind firing to suppress enemies. The weapons even sound and look like something out of the Gears universe. But the similarities end there. In all honestly I had a hard time controlling the game on the PC, the controls using a mouse and keyboard felt too floaty. 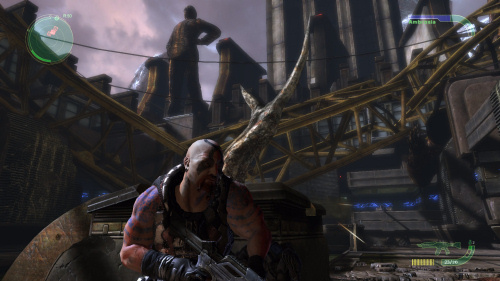 Perhaps the aforementioned Gears of War is too en-grained in my gaming brain for the third person shooter genre, in fact, I plugged in my 360 controller and played through the rest of the game that way after just a few missions. Since The Scourge Project is coming to XBLA, it worked seamlessly and the game felt more natural too me. The most unique aspect of The Scourge Project is in the game's co-op, something the entire thing was built from the ground up for. 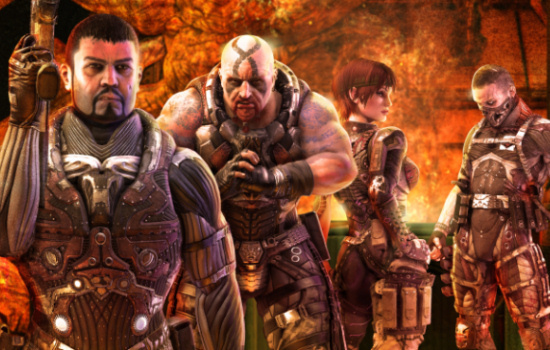 With four different characters of Echo Squad; Stonewall, Amp, Mass and Shade, each of which have their own unique perspective on the game's story. It's this perspective that's presented to each player in a different cut scene at the same time. In theory it's a really unique aspect to the game that sets it apart from other cooperative titles out there, in execution it occurs pretty infrequently. I suppose I overhyped myself for this, and to be fair, I didn't get to experience every characters cut scenes, so there may be more to it. Each character's suit can use a special attack that is powered by Ambrosia that's found throughout the levels in barrels. Simply standing next to these recharges your meter. One attack might push out a beam of energy that explodes, put up a small shield, or explode the ground near your character. As I said earlier, gameplay is somewhat tactical, where players must utilize cover and pop in and out to attack and move your squad. One problem I seemed to have, and perhaps it's intentional, is cover doesn't keep you complete safe. While working through the variety of levels, including indoor and outdoor style settings that remind you of Aliens, you'll also need to work with your teammates not only to cover, maneuver and flank your enemy, but to revive your fallen comrades. The Scourge Project is not very forgiving with damage, with two or three direct hits taking you down. When playing in co-op, this isn't a problem, but in single player it becomes much more of a nuisance. While the AI does a fairly good job of reviving you, it almost never revives fallen AI. One other interesting aspect to the game's co-op mode is the experience system. The game rewards experience depending on your play style. If you revive fallen squadmates often, you'll get +3 in co-op experience. Use melee attacks a lot? +1 to Assault. Shoot enemies where they stand? +1 to weapons. This experience eventually levels up your character, earning you new badges that are displayed on your profile. As you browse for co-op games to join you can see where the other players in the game stand in terms of this. In theory it should help you find a more balanced team. In an age where we're seeing more and more smaller studio titles find their way to the mainstream, The Scourge Project manages to set itself apart with extremely high production values, solid graphics, and lots of replayability. Sadly I feel it's held back by some mechanical issues, issues that may be fixed over time through patches or updates. Alongside the campaign is a host of multiplayer modes for sixteen players, adding to the value for this $20 title. If you can find four players to co-op through the game, you'll be in for a somewhat enjoyable experience. But if you are forced to play with any AI, you may find yourself cursing up an Ambrosia storm. The Co-Op Experience: The game features a four player co-op campaign. Gameplay is from a 3rd person perspective. More details coming soon.